Previously, we mentioned vacuoles as essential components of plant cells. If you look at Figure 7, you will see that plant cells each have a large, central vacuole that occupies most of the cell. The central vacuole plays a key role in regulating the cell’s concentration of water in changing environmental conditions. In plant cells, the liquid inside the central vacuole provides turgor pressure, which is the outward pressure caused by the fluid inside the cell. Have you ever noticed that if you forget to water a plant for a few days, it wilts? That is because as the water concentration in the soil becomes lower than the water concentration in the plant, water moves out of the central vacuoles and cytoplasm and into the soil. As the central vacuole shrinks, it leaves the cell wall unsupported. This loss of support to the cell walls of a plant results in the wilted appearance. Additionally, this fluid has a very bitter taste, which discourages consumption by insects and animals. The central vacuole also functions to store proteins in developing seed cells. Lysosomes also use their hydrolytic enzymes to destroy disease-causing organisms that might enter the cell. A good example of this occurs in a group of white blood cells called macrophages, which are part of your body’s immune system. In a process known as phagocytosis, a section of the plasma membrane of the macrophage invaginates (folds in) and engulfs a pathogen. The invaginated section, with the pathogen inside, then pinches itself off from the plasma membrane and becomes a vesicle. The vesicle fuses with a lysosome. The lysosome’s hydrolytic enzymes then destroy the pathogen (Figure 12). 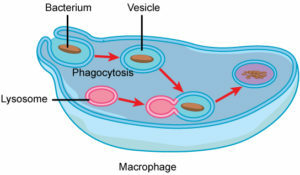 Figure 12 A macrophage has phagocytized a potentially pathogenic bacterium into a vesicle, which then fuses with a lysosome within the cell so that the pathogen can be destroyed. 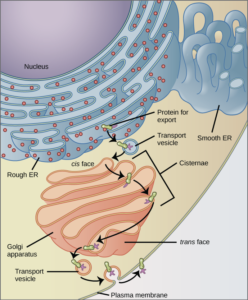 Other organelles are present in the cell, but for simplicity, are not shown.